No. 7 The Strand, Barnstaple. 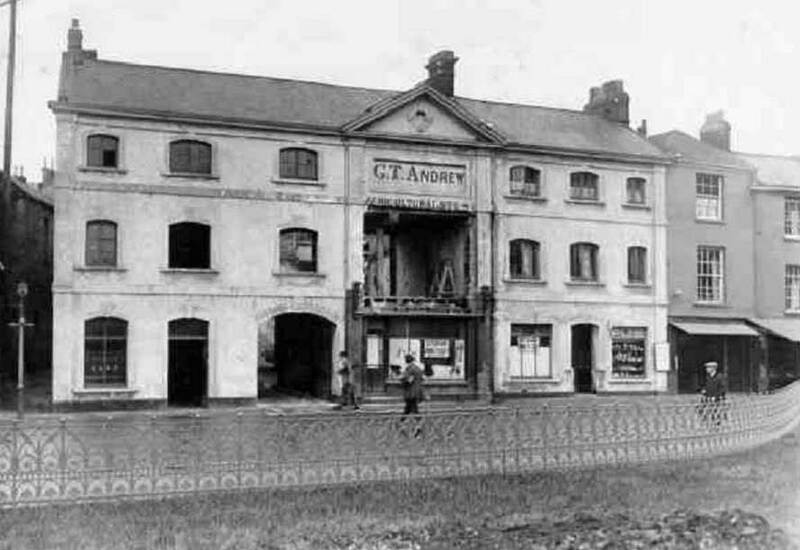 Now a Weatherspoon’s pub, then a office & store rooms for a “local manure merchant” GT Andrew. Modern day photo supplied by Michael Parkin. 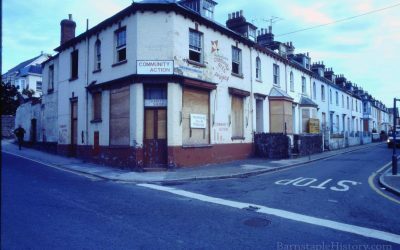 How many people have walked along the Strand in Barnstaple and looked carefully at the building that now houses the “Zenaxis” nightclub and discotheque? It is a large and sturdy building which has a somewhat surprising history. The story goes back to around 1812 when one Robert Arnoll, or Arnold, established himself as a baker and confectioner near the churchyard. He slowly worked his way up the ladder of success being able to move to a shop in the high-street in 1837 where the business was to be located for the next 30 years or so. Within two years, in May 1854, Arnoll had taken a partner, Thomas Hodge, and they had opened a small biscuit factory “in confined premises in Tuly street.” The business, although small, was given the grand title of “The West of England Biscuit Manufactory”. The sales seem to have being healthy as in April 1856, the partners were advertising for suppliers to meet their requirement of 500lbs of butter per week. True to the Victorian ideals of growth Arnoll and Hodge were joined in 1857 by a third partner, Mr Horwell, who brought in the capital needed for further expansion. The three men carefully looked around Barnstaple before finally buying the old merchant warehouses of Arter & Sons on the Strand. These were then extensively remodelled and rebuilt and “furnished with costly and beautiful machinery propelled by steam engine of 12 horse power, which, while it relieves the men employed of the Herculean labours to which they had been accustomed, necessarily dispatches a large amount of work in a short time.” The company was renamed “The West of England Steam Biscuit Company” to mark the arrival of steam power to the baking industry in North Devon. In January 1858 ,the move had been accomplished and the new factory was working at full power. To celebrate the partners held an “inaugural dinner” for their “staff of respectable workmen and boys.” After the dinner various speeches were made and it was noted that “new accounts were opening not only in Barnstaple but in almost every other part of the Kingdom.” Amongst these was one from Queen Victoria who was partial to one variety of ‘crisp’ biscuit. 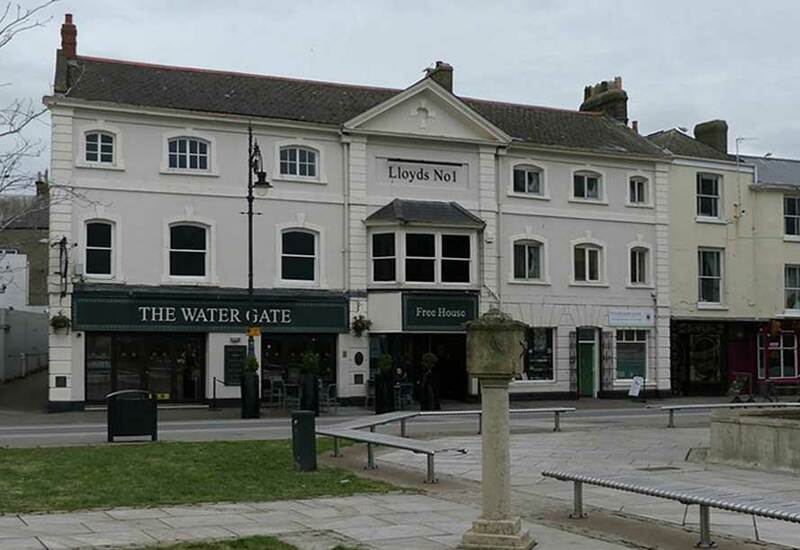 It was also announced that the senior partner, Mr Arnoll, was opening a second shop in Barnstaple’s High-Street to cope with the increased output and demand. This dinner appears to have become an annual event at which the year’s successes were praised and further successes forecast. Two years later in August 1860 the company took out a 21 year lease with the town council for premises in Castle Street known as ‘The College’. This extra space and appears to have been used for accommodation for the workers and storage space. In the same month Earl Fortescue and his son, Lord Ebrington, visited the Strand factory. The two “Expressed themselves highly gratified with the machinery and general arrangements, indeed, with everything they saw.” They were informed that 60 hands were employed and remarked on the importance of the firm to the town. These were, however, only minor upsets in the progress of the firm. By 1862 they had taken over adjoining buildings in order to enlarge the factory and were looking for even further expansion. This was achieved in two ways – Robert Arnoll’s breadmaking business was merged with the biscuit factory and the company was made a joint stock undertaking being renamed “The North Devon Bread and Biscuit Company Limited.” This allowed the selling of shares in the business which, it was hoped, would give an injection of necessary working capital. 4000 £5 shares were issued and a contemporary advertisement shows that Mr Horwell had been replaced by a Mr Hancock. The success of this move is reflected by the fact that Arnoll won the contract to supply bread to Barnstaple prison in 1862, and also was the contractor to supply food for the Mayor’s banquet in the same year. These orders were in addition to the contract for bread supply to the local hospital. This was the peak of the partners success when everything seemed to be going well for the firm and its innovations. Within six years, however, all had changed. 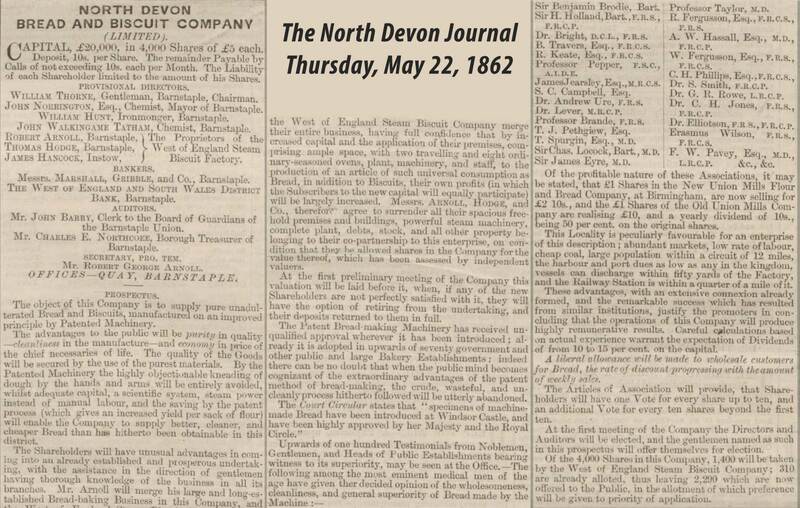 In January 1868, the North Devon Journal carried a report about a meeting held at the company’s ‘Factory’ where “it was unanimously resolved that it was desirable in the interests of the town that a joint stock company should be formed with a view to purchasing the machinery and plant belonging to this company, which is now being wound up …” The reason given for this was that “by the introduction of sufficient capital and more efficient management, what had been for some years past an unremunerative speculation would undoubtedly prove a success.” A later report also adds that “all the original proprietors are dead” – though when they died its something I have yet to discover. This initial hiccup was overcome, and the first AGM of the new company was held in December 1869. At this the directors heard that the Barnstaple factory had been purchased, sufficient operating capital(some £6000) raised, and the services of one Mr Lucop, late of “Huntley and Palmers’ secured as manager. In addition £600 had been spent on new plant which “when fixed, will nearly double the producing power of the manufactury.” Then one travelling salesman, a Mr Doble, reported that orders had increased greatly since Mr Lucop had taken over. A London depot had also been opened to attempt to increase the national sales under a Mr F Hodge – possibly a relation of one of the original partners. Plans were also unveiled for a scheme “to induce the licensed victuallers to take their biscuits, and also to extend the export trade.” The new company’s approach to increasing sales sounds surprisingly modern – “the country had been marked into districts, and information collected which would be made available as soon as they were in a position to cover the ground.” Everything once again seemed rosy – but this was the Victorian world of cutthroat competition and heartlessness. This is shown when only the next year William Arnoll who had inherited and carried on Robert Arnoll’s business was declared bankrupt. Although Robert had founded the biscuit factory no help had come from that quarter and poor William disappears into obscurity. It is difficult to work out what happened but two of the London-based directors had argued with the rest of the board and resigned. They had also asked for the return of their part of the capital – which the company did not have to hand. Distraint orders were issued and the business speedily put up for sale. In October 1871, the company’s assets were auctioned off at Exeter. 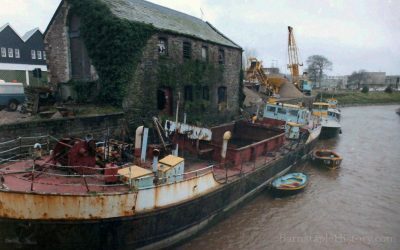 The factory premises were described as having a frontage of 73 feet to the Quay and the annual turnover of the firm was put at £20-£25,000. 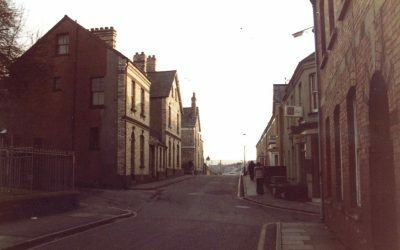 A second lot was a house in High-Street “immediately to the rear” of the factory which was occupied by the North Devon Herald and a boot-maker Mr Crabb. There were only two bidders – William Carter an Exeter grocer and Mr Swann a solicitor acting for the West of England Bank. The premises went for £2800 to the Bank – the money being only just enough to pay off one of the mortgages! The high-street property raised a further £680. This earnest wish was successfully answered. 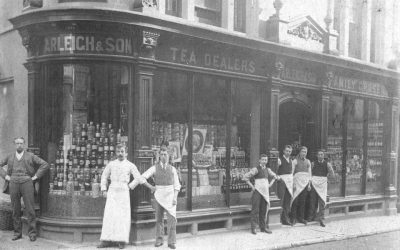 Within a few weeks a new company had been formed with four directors – the local MP, Charles Williams, John Sanders a Barnstaple tanner, William Gould a large merchant and Thomas May a local grocer. This new company had hedged their bets by only leasing the factory rather than buying it outright. They did, however, continue to use the old name. The winding up of the old firm dragged on for several years with many drawn-out court cases. 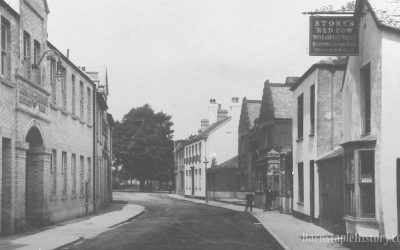 The rest of the factory had been taken by GT Andrew, a local manure merchant who based his offices and stores there – not a very happy combination with the cake manufacturer; Brooks, however, seems to have prospered and by the 1890s was also running restaurant in the same premises. Within 20 years his business had been taken over by Arthur Bromley who described himself in 1919 directory as “Pastrycook”. Like Brooks before him, however, he soon developed a cafe to complement his bakery which, by 1926, had taken over the whole of the old Biscuit Factory premises. Many people can of course remember the Bromleys Cafe and Milk Bar on the Strand. The business, however, closed some years ago though the bakery continues and the main part of the building then became a discotheque now known as ‘Zenaxis’. Under its present owner Mike Deakin it has seen a good many changes but the building would still be recognised by Robert Arnoll if he could return today. The history of business isn’t usually seen as being very interesting – yet anyone following the fortunes of the major biscuit maker of Barnstaple cannot but be fascinated by the various twists and turns of fate and fortune. From the first machine-made bread in North Devon to its premier discotheque is some jump – but at least the building is still vibrantly alive. Originally published in the ‘North Devon Magazine’ Autumn 1987 by Peter Christie.